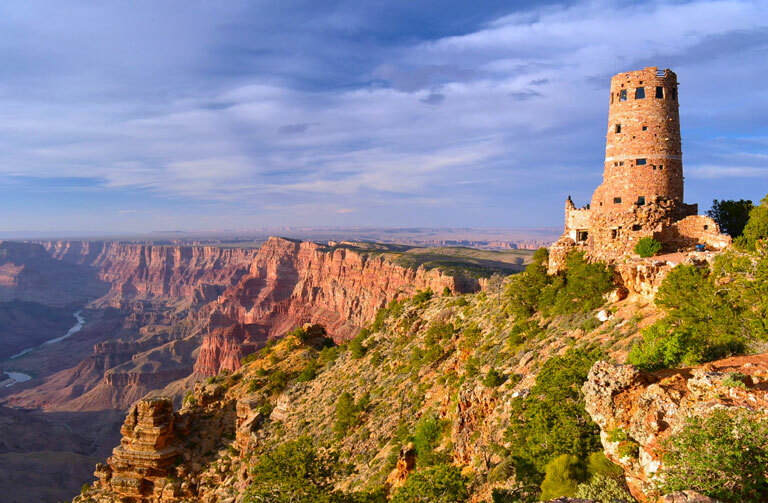 Grand Canyon Day Tour from Flagstaff - Group or Private Luxury Grand Canyon Day Tours customized to your interests and desires. * All times are approximate. You are guaranteed 5 hours in the park! * November 1 to March 15 we discount the tour $20 for adults and children and lunch is not included, as it is typically too cold for a picnic. We bring you to the historic El Tovar for lunch (located on the rim of Grand Canyon). You are responsible for your bill. Infant prices are not discounted. Our daily Grand Canyon Tour from Flagstaff is available exclusively from Flagstaff, which allows for a full loop of the Grand Canyon. We provide round trip transportation from all Flagstaff properties. This is a full day tour (roughly 8:30 AM - 5:30 PM)! Once guests are picked up in Flagstaff, it is approximately a one hour and twenty minute scenic drive to the Grand Canyon South Rim. Our Professional Guides are experts in the most incredible places and the best times to visit view points in Grand Canyon National Park. Grand Canyon Village - This section of the park contains a number of historic buildings, the Grand Canyon Railway Station, shops and restaurants. Yavapai Point - This vista is the most expansive view of Grand Canyon and is home to Herbert Maier's historic Yavapai Observation Station. Mather Point - This viewing area is quite extensive - the point has two narrow, railed overlooks built on projecting rocks and is near the Visitor Center. Grandview Point - This viewpoint, developed in 1892 by Pete Berry as a copper mining operation, was an original destination for Grand Canyon tours. This view point is reached by a one mile side road, that juts out on a peninsula providing expansive views of the Grand Canyon. Moran Point - This viewpoint offers far reaching views along a wide section of the Grand Canyon, approximately between river miles 87 and 72. The point is due south of Cape Royal on the North Rim. Tusayan Ruins - The Tusayan Ruins and Museum are excellent places to take a glimpse into the lives of the native peoples of the region. * This is typically where we enjoy our picnic lunch. Lipan Point - This vista has the best view of the Colorado River on our Daily Grand Canyon Tour, and is a favorite stop for our guides as well as guests. Desert View - This is the easternmost viewpoint at Grand Canyon National Park and home to Mary Colter's historic Desert View Watchtower. The tower was built in 1932, right on the cliff edge and visible for many miles across this part of the Canyon. Cameron Trading Post - This is our last stop of the day on the Navajo reservation. It gives our guests a chance to shop and support the native people of the area. This is a brief stop, and not the main focus of the tour. For folks traveling from Phoenix or Sedona we recommend choosing to book this Flagstaff tour and meeting us at the Hampton Inn & Suites West. Our Flagstaff pickup times are between 8:30- 9:00am depending on where you are staying in Flagstaff, and guest typically get back between 5:00-5:30pm (during the busy season the tour may get back a little late due to traffic), this is a full day tour! America's Best Inn - Milton Rd. Comfort Inn - Beulah Blvd. 1000 N. Country Club Dr.
100 N. San Francisco St.
1400 North Country Club Rd. Door to door transportation in a safe ADOT certified leather-bound touring van or SUV. Tours are limited to 10 guests. Great for all ages! Not a lot of walking, but not just stuck in a vehicle all day. Friendly, professional, and knowledgable guides. High powered spotting scope available for viewing wild life, ancient cliff dwellings of native tribes, and the Colorado River. Delicious lunch is provided by Brandy's Restaurant, featured on the Food Network's Diners, Drive-Ins & Dives. Vegan, Vegetarian, and Gluten-free lunch options available upon request. We use real silverware, ceramic plates, and linen for our picnic lunch. Bottled spring water, beverages, and snacks served throughout the tour. Fantastic photo opportunities throughout the day. Proud member of Leave No Trace. Tread lightly, as our footprints should go unseen as we walk upon the Planet Earth. Our daily Grand Canyon Tour from Flagstaff is available exclusively from Flagstaff. You will travel a loop of the Grand Canyon entering through the South Rim and exiting through the East Rim of the national park. Our daily tour route from Flagstaff does not waste time backtracking through Williams or Tusayan, so you will spend more time at the canyon rather then in the vehicle. 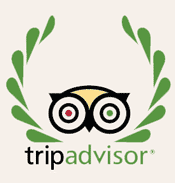 Our experienced, Professional Guides will pick you up at your hotel, bed & breakfast or campground and drop you off right back there at the end of an amazing day. Guests are never more than five to ten minutes away from the vehicle as they visit several major viewpoints and other stops. Throughout the fully-narrated day, guides share their knowledge of local geology, flora and fauna, biology, natural and cultural history. Guides also share views through a high-powered spotting scope, catching sight of mules, rapids, ancient ruins, mining areas, wildlife, and hikers while visiting the different vistas within the Park. Our daily sightseeing tour allows guests plenty of time at each stop to enjoy the views, take photos, and learn fun and interesting information from their guide. Don't worry about packing a lunch, snacks, beverages, or even water. We have you covered with snacks and drinks an arm's reach away all day long. 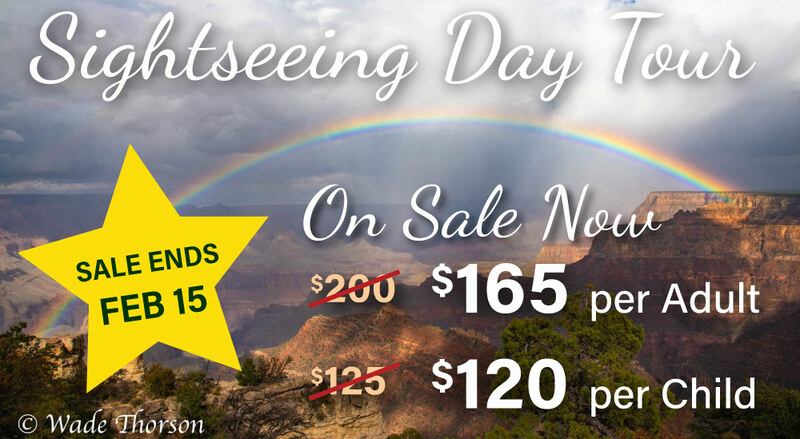 Our tour price is all-inclusive and there are no hidden fees at checkout and includes Grand Canyon entrance fees and tax. What you see is what you pay!